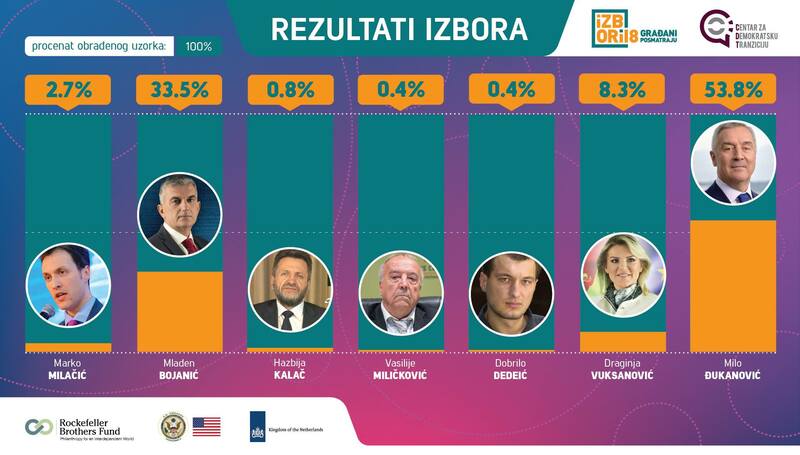 Voter turnout in 2018 presidential elections in Montenegro is 64%. By 7 P.M. 59.3% of citizens voted. By 6 P.M. 54.6% of citizens voted. By 4 P.M. 46.5% of citizens voted. Polling boards in 23 municipalities in Montenegro approved around 9,000 requests for home-bound voting, which is about 1.7% of the total number of registered voters. at PS No.19 Gallery “Center”, Podgorica, polling board allowed a person without valid personal documents to vote. The person voted based on the certificate issued by the Ministry of the Interior which states that documents were stolen and that a person is waiting for the new. This is contrary to the Article 80 of the Law on Election of Councilor and MPs which clearly states that voter proves his/her identity with a biometric ID card or passport, and that a voter can not vote without an identity proof. Until 12PM 27,2% or 144.600 of citizens voted. Today , citizens of Montenegro elect their President for the next five years. There are 532.599 of registered voters. Citizens of Montenegro can exercise their voting right at 1214 polling stations in 23 towns, as well as at polling stations in Detention and Rehabilitation Center Podgorica and Bijelo Polje prison. Polling stations are opened from 7 to 20h. Until 9AM 6.4% or 34.270 of citizens voted. at polling station No. 69 Vuk Karadžić, Podgorica, members of the polling board speak out loud names of voters, which is contrary to the rules which forbidden to polling borad president and members to pronounce name and surname of voter , and also his/her number in voters list excerpt. CDT accredited and engaged 350 observers for election monitoring. Citizens’ election monitoring CDT implements with the support of US Embassy in Podgorica, Rockfeller Brothers Fund, Embassy of the Netherlands in Belgrade and Viber company.